On Tuesday, December 4, 2018, we will proudly present a one-of-a-kind concert evening, “Honoring Bessie Smith, The Empress of the Blues.” We invite you to be a part of this unforgettable evening! 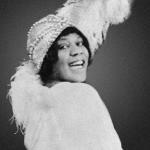 We intend to celebrate Bessie Smith, along with 100 years of American music. Our brilliant guest artists will perform a mix of historic Bessie Smith material as well as original music, which in total, will reflect the diversity and brilliance of the great canon of American music spanning one hundred years, revealing styles such as blues, soul, jazz, roots, Americana, country, rock, folk and more. Bessie Smith earned the title of “Empress of the Blues” by virtue of her forceful vocal delivery and command of the genre. Her singing displayed a soulfully phrased, boldly delivered and nearly definitive grasp of the blues. In addition, she was an all-around entertainer who danced, acted and performed comedy routines with her touring company. She was the highest-paid black performer of her day and arguably reached a level of success greater than that of any African-American entertainer before her. Bessie Smith was inducted into the Rock & Roll Hall of Fame in 1989.